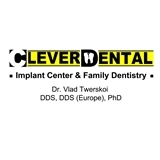 Clever Dental (Denver) - Book Appointment Online! I broke a lower back crown that I got 20 years ago on Saturday evening. It cause my tongue to get irritated and slightly swell. I called Vlad Twerskoi's office on Monday at 7:05. He and his staff had me in his chair at 9 AM and smoothed out the broken crown to give me relief. I got another appointment to get the crown fixed and went right back to work. He has been my dentist for three implants and several cleanings. I keep coming back because he does great work and his office staff is friendly and concerned about my dental health.